i don't do new years resolutions simply because i make mini goals for myself all throughout the year and don't want to wait until January 1 to start something. it generally turns out that once January comes i'm in the midst of something i started a few months prior. plus, making a goal for an entire year is just way too overwhelming to me so i prefer to stick to my ongoing mini goals. for the past few years (2014, 2015, 2016) i have chosen a word for the year though, to start the year off in the direction that i hoped to continue on. my word for 2016 was trust, because at the time i chose that word i was in the midst of applying to grad school and praying about the career change i would be embarking on if accepted. i knew i needed to place my trust in the Lord with all of the changes that 2016 would hold. and it was good for me to process through that even before anything started happening with grad school, leaving my job, and moving to a new city. 2016 was a very busy year for us. i got accepted to grad school, made the decision to pursue my dreams, drove to our new city a lot to set things up for school and my internship, we purged our house and got it ready to sell, we sold our house, became nomads for a few months, i quit my job, we moved to a new city, and i successfully completed the first semester of my MSW program. thinking back on everything that 2016 held makes me feel exhausted! now it's 2017 and my second semester of grad school has started full force. i'm back to full days in class and internship, with hundreds of pages to read on nights and weekends. last semester i only had 2-3 days where i did no school work and i am hoping to have more than that this semester. i'm working on planning a schedule to get more done on weeknights so i can have some weekend time to spend with Thomas. so that is my main goal this semester. in looking at 2017 as a full year of grad school, including classes over the summer, my first thought is that my word should be survive. and sadly that was my main goal during my first semester because i wasn't sure what to expect. so trying to keep up with everything going on just had me in survival mode. however, i want to do more than just survive this year. because as much as i want to get schooling behind me and start my new career, i also want to live the year that i have in front of me. 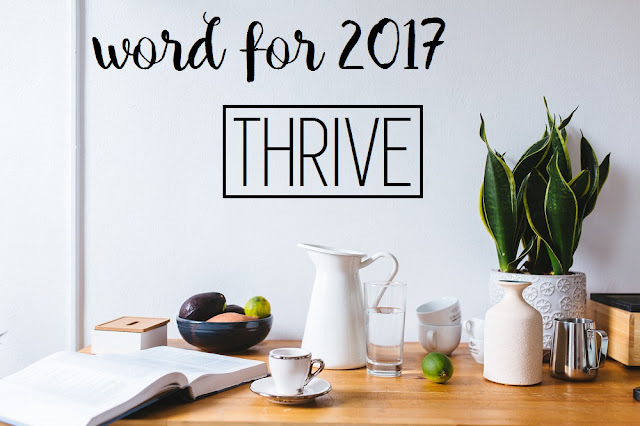 so i've chosen thrive as my word for 2017. i want to thrive as well as survive this year, and really enjoy the year in the midst of all the busy days. i want to live life this year rather than push through this year just to get to the next stage of my life. it's easy to look forward and survive, but it's harder to be still in the moment and thrive. "You make known to me the path of life; in your presence there is fullness of joy; at your right hand are pleasures forevermore."